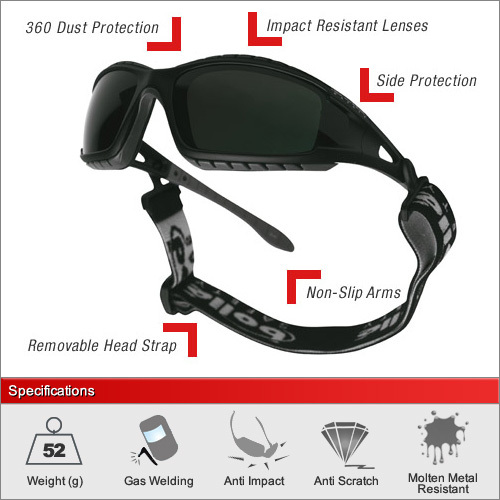 The Tracker is the only pair of safety glasses in the world to double up as safety goggles when used with the adjustable / removable head band supplied with every pair. This welding model includes all the same high-end features such as the reinforced frames that use interchangeable foam pads for comfort and to create an excellent 360 degree barrier to dust and other particles. 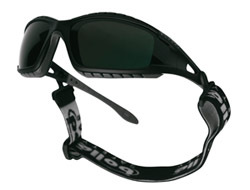 Each pair is supplied with a MicroFibre pouch for storage and cleaning. We have three welding shades in this model. Shades 2,3 & 5. Please use the drop down menu above to select your lens type. For a full explanation of the different lens types and their ideal usage please see our dedicated Welding Advice Section.